SL President Maithiripala Sirisena promised to resettle the people of Mu'l'lik-ku'lam before the end of 31st December 2018. Despite the repeated pleas the people made through their political representatives in the SL Parliament and the Bishop of Mannaar taking up the matter with the SL President and his secretariat in Colombo, nothing has taken place, complained Rev Fr Lawrence Leon on Monday. The SL Navy was refusing to release the lands and is still putting up constructions while the people are languishing without infrastructure and roads. Last year, a bus transporting people narrowly escaped from a fatal accident during the Christmas time. The new year mass at the church of Our Lady of the Assumption at Mu'l'li-ku'lam has therefore been moved to the morning on 01st of January 2019, the parish priest further said. All concerned must act immediately to get the SL President to act before the Pongkal celebrations in mid-January and renew the hope for a better future in the coming year, the priest told TamilNet at the New Year's Eve. The SL Navy is still consolidating its military infrastructure in the seized lands of the people and are putting up roads and other permanent structures, the priest noted. At the end of October 2018, when Colombo was engulfed in a political turmoil, the SL Navy stepped up harassments blocking an access road. A tense situation prevailed as the people demanded the immediate removal of barbed-wire. In 2007, more than 200 Tamil families were living in the village, which is facing towards the Gulf of Mannaar. It was part of LTTE administered territory until September 2007. 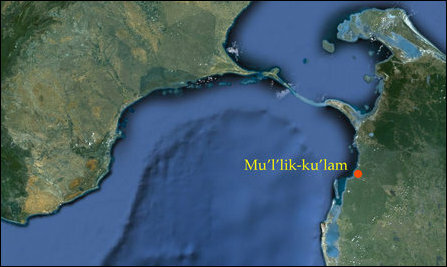 After 2009, Mu'l'lik-ku'lam has been slowly transformed into a strategic point of occupation by the SL Navy. The Command Headquarters of its so-called “North Western Naval Area” is located now. The occupying Sinhala navy was also trying to Sinhalicise and colonise the land for Sinhala settlers. In January 2013, Sinhala Archbishop from Colombo and a Cardinal of Vatican, His Eminence Malcolm Ranjith, had personally come along with genocidal Colombo’s notorious Defence Secretary at that time, Gotabhaya Rajapaksa, in a bid to permanently seize Mu’l’lik-ku’lam village for the SL Navy. The SL Navy base is located in 35 acres. However, it retains hundreds of acres of lands of the village and the Musali division. Refusing to give up, the uprooted Tamil Catholics took to street waging several protests. Finally, the people commenced a continuous protest in 2017 for 38 days. In an attempt to contain the continuous protest, the occupying SL Navy allowed 50 families in March and April 2017 to move into the church. 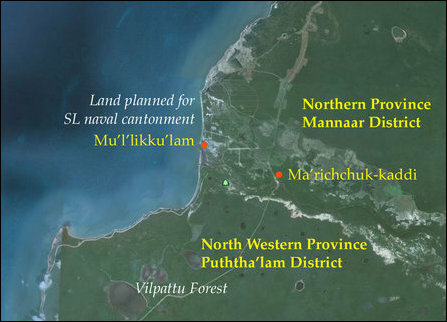 The SL Navy also said it would consider handing over a pocket of 77 acres of the total 5,000 acres back to the people. As there were no signs of returning their lands, the languishing families entered into some of their properties in July 2018 setting up temporary huts.